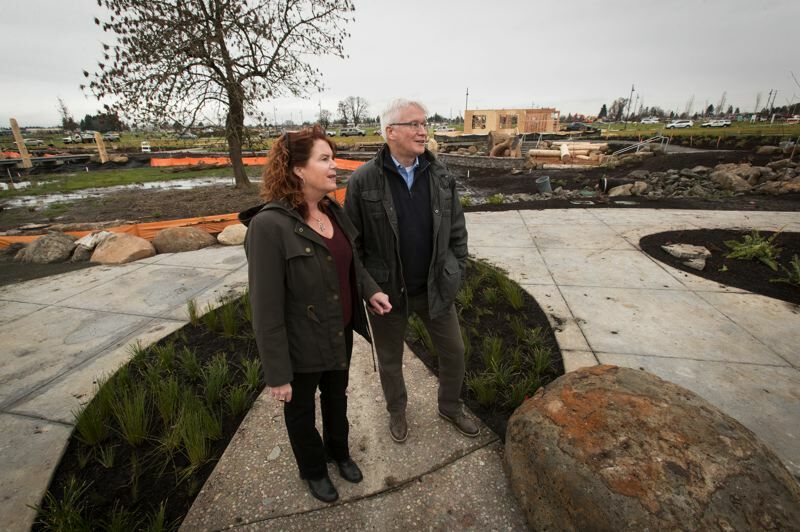 Supplanting farmland, Reed's Crossing in South Hillsboro aims to be a new kind of suburb, with more variety, less commuting and a targeted green space. Reed's Crossing is finally on the move. 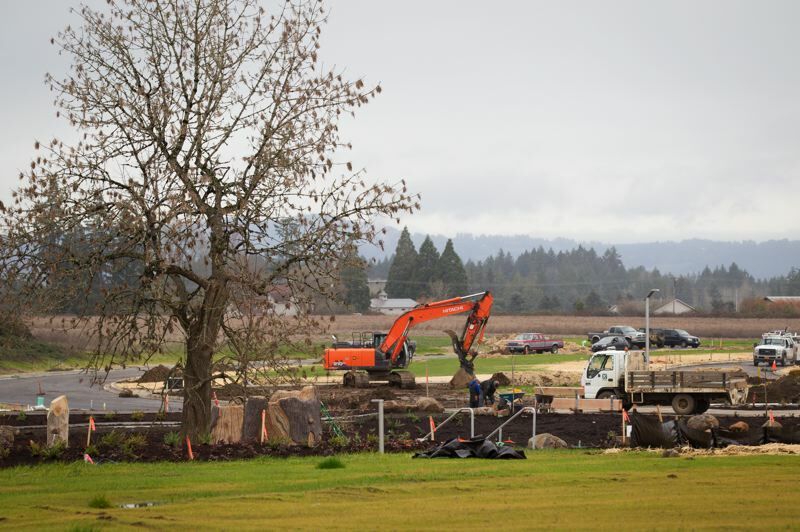 Workers broke ground this month in South Hillsboro on the massive neighborhood planned along Tualatin Valley Highway at Cornelius Pass Road. 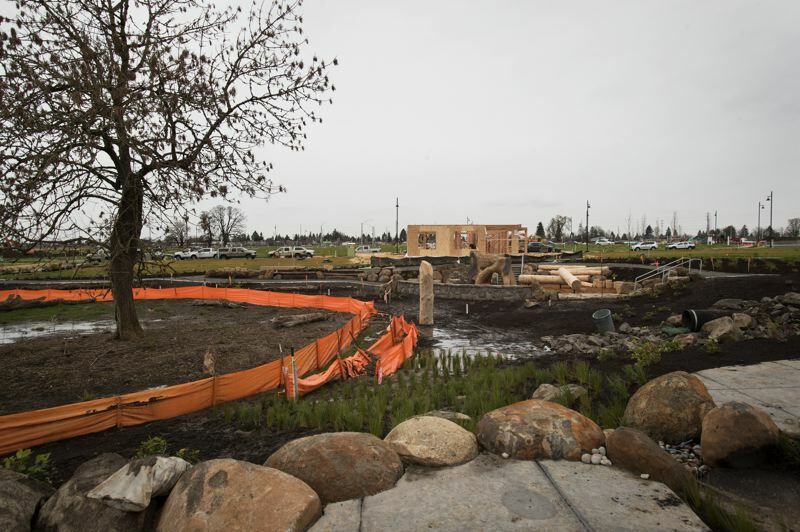 Home building begins in earnest this week, according to Kelly Ritz, president of home builder Stone Bridge Homes NW, and the first residents are expected to move in this summer. David Brentlinger of developer Newland said he expects 15 homes to be built per month, rising to up to 30 per month at its peak. The first phase of Reed's Crossing's development will see the creation of 300 homes, expanding to approximately 3,000 homes over the next decade. National homebuilders Lennar and David Weekley are also on board early. Last Friday's groundbreaking marks the first of several phases of homebuilding over the next 10-12 years. (The Reed's Crossing buildout will take 10 to 12 years). When finished, the area will include miles of walking trails, over 50 acres of parks and open space and several special bicycle lanes, called cycle tracks, which are separated from other motor traffic. The Greenway runs along the Gordon Creek. The creek bed was landscaped by Teufel. 200,000 grass plugs were hand-planted to make it look as inviting in rainy January as in parched September. A few trees that were kept are scattered around for a rustic look, but the trees to climb on are pointed and have the bark stripped off, as though giant beavers had worked them over. A play area, referred to as the Nature Education Area, and small bridges are the focus of the Greenway. The first houses will face the Greenway, which will be complete this month. Drivers will approach their homes from the rear via an alley. The goal is to create a less atomized suburbia, where residents do more than drive into their snout-houses and hide in front of giant screens. People are expected to walk more than a block, to reconnect with nature, and socialize. Newland owns 463 acres of the 1,400 acres that comprise South Hillsboro. 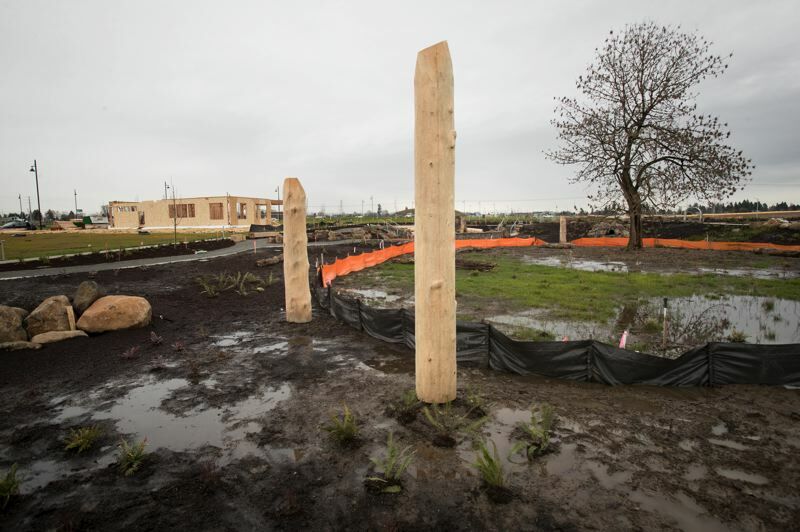 The site appears from Southeast Tualatin Valley Highway as newly built roads and concrete curbs and empty lots. Now the first show home is rising up, functioning as a Welcome Center. The four-bedroom home will have three community reps and a marketing coordinator who can talk about the planned community and speak impartially about the different builders who have bought parcels and are ready with their home designs. The Welcome Center will also have a conference room for real estate brokers and builders to have meetings. It will also have a fire pit and a back patio overlooking the greenway and space to take a virtual reality tour by bike or a seated experience. 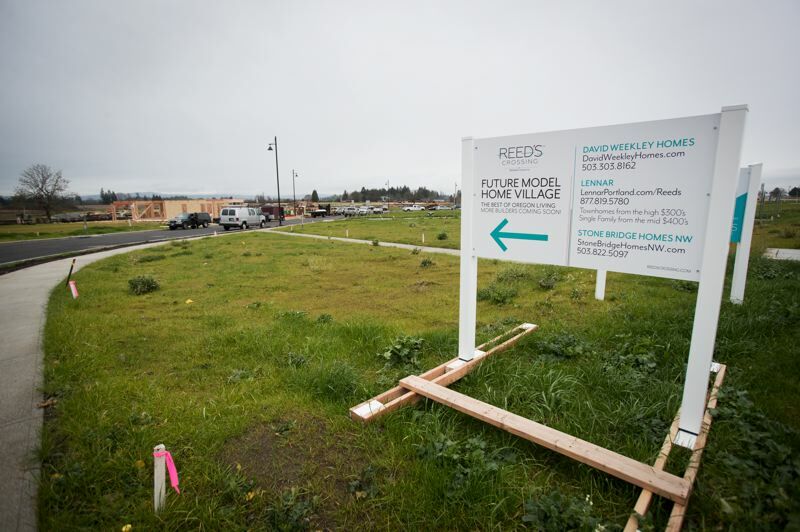 Reed's Crossing bills itself as a "mixed-use, master-planned community, the largest of its kind in Oregon." It will include schools, recreational spaces parks and trails, and a town center with shopping, dining and businesses. Newland bought the farmland with money from investment funds which are dedicated to new housing. Newland sells parcels to different home builders, some national, some local. The builders then design, build and sell the homes one by one to the public. The largest planned housing development in Oregon history, South Hillsboro will eventually be filled with 8,000 homes, according to city officials. When finished, the area will be home to about 20,000 Hillsboro residents. 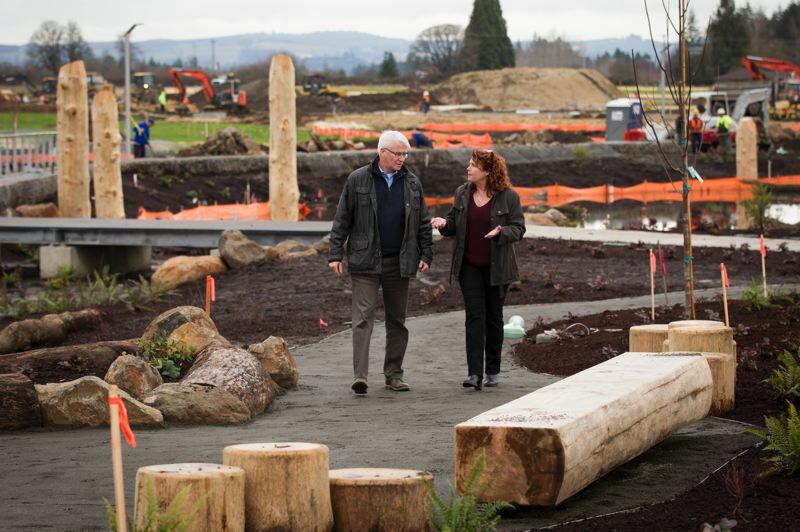 City and county planners have been planning South Hillsboro for close to two decades. Stone Bridge Homes NW, which also built homes at the 2018 Street of Dreams next to the nearby Reserve golf course, is the only local homebuilder. Brentlinger, who is vice president of operations for Reed's Crossing, said the master planned community would aim to avoid the cookie-cutter look of some national homebuilders by mixing in cottages and townhomes with the usual three- and four-bedroom homes. Prices would range from $300,000 to $750,000 respectively. Typical subdivisions often build large tracts of spec homes in just a limited number of designs. Ritz said most of her buyers opt for semi-custom production homes. This allows them to see the plans and tweak designs, for instance to add a sewing room or make the den into a granny flat. "If we can build a model home in 120 days, we may be able build a model house in 75 days," says Ritz. "That's because we're going to have tight time frames and coordinate with our subs. But (because) it's been a long time coming and we want it to look great when the public comes out, all the builders will be pushing hard to be ready for that." She also builds in Bend where it's all smaller, local builders, not nationals. "I have yet to see anyone come to fisticuffs, but it's tight." They have meetings about deliveries of large roof trusses and pouring foundations: times when the workers could get in each other's way. "It's more difficult than delivering in your own neighborhood, but you just have to coordinate." They also will build spec homes available for people who don't have the time or inclination to change the design. "For us the semi-custom is our niche. It's a great fit for Reed's Crossing because it wants to be able to offer something for everybody." The planned community will offer a bikeshare node to encourage people to ride north as far as Salesforce and Intel, and to connect to transit at Orenco Station a mile and a half away. The developer pays for all the infrastructure, although it gets some credit from the city. "We fund it all period, and we get some amount of reimbursement for some things," says Brentlinger. 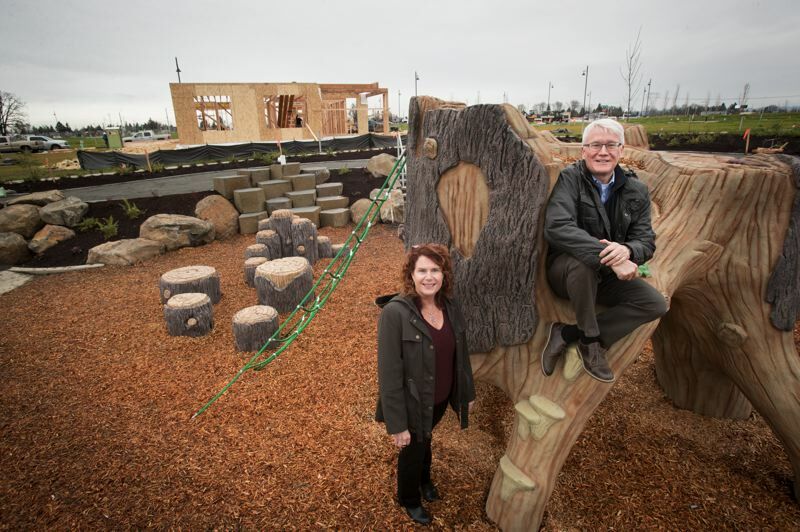 "Some of the parks we are building will become city parks, we'll get some credit for that. It's a huge investment. Ultimately, we get our money back on the lot sales to the builders." Drone video shot by Brian Merritt of Minuteman Mortgage has been showing the progress of the development. The mint condition streets and curbs are all laid out. Sewer, electricity and cable lines have all been buried long ago and are marked by flags. All that's needed is for trucks to drop of piles of lumber, known as packages, and for workers to start throwing up stick-built homes atop concrete foundations. The lumber packages sit outside overnight. There is no fence around the site, only a security guard driving around to prevent theft. The site of Reed's Crossing is currently quiet but the excitement is about to start as the building permits come in. What makes people move in en masse? "The thought is Reed's Crossing is going to be different, something unusual, which will make people want to get in now," says Brentlinger. "Then there's the market condition. A homebuyer says 'I'll buy in now and things will be going on around me." He adds: "As the community grows and fills in it becomes more desirable, and the market in general goes up. There's a housing shortage in Washington County." Looking at where the town center will be, Ritz says: "This will be the newest and nicest town center you've seen in forever. If you look at the commercial stuff around here, there's not much of it. There's been some little pieces. I remember driving from Beaverton to Hillsboro and there was the Harvey's Rabbit Marine, and a 7 Eleven and one other thing, very rural. Something like this is a bigger draw to a whole new community." The town center will be 36 acres adjoining Cornelius Pass. Within there will be 600 apartments, condos, businesses and shops. "That'll be a more urban experience. What we don't have is high-end housing by the golf course, the 10,000 square-foot lots." If they build it, where will they come from? 1,500 people have signed up for the newsletter since launching the website. "Every time we look at our web analytics Portland is number one, followed by Beaverton, Hillsboro, then Washington, California, Texas, Arizona," says Rimpal Singh, marketing director for Reed's Crossing," We are having numerous meetings with local area businesses, just to tap into how they're hiring all these people, where are they coming for, what housing are they looking for." "I see a lot of people in Bend who telecommute part-time (from home) but they have to be in Seattle or San Francisco three days a week. I think we're beginning to see that here. With such high employment, companies are trying to provide amenities to their employees, and that includes flexible work schedules." There are some jobs you must go to, such as cracking open a lumber package and framing a house, or driving around at night providing security. Others you can do at home on your computer. In places like Reed's Crossing, it will be interesting to see who ends up doing what. 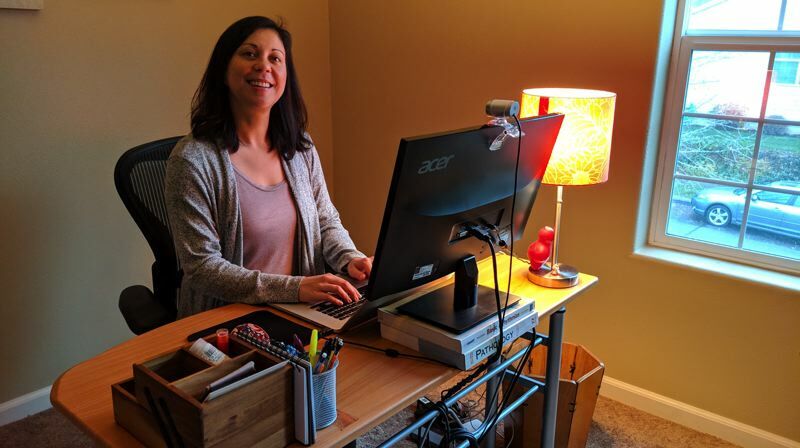 What is it like being a telecommuter in Hillsboro? Patricia Behre works as a Conversion Optimization Program Manager for Red Hat, a leading provider of enterprise open source technology solutions. She has a one-year old baby, Lincoln, who is at home with her part of the day. She's loving being a mom and says Lincoln is a really good baby. "With the baby, I cut back on my hours to a pretty standard 45 hours," she says, down from about 65 hours. She is a full-time salaried worker, not a contractor paid by the hour. "It's enterprise technology and that's just the expectation." "It's not uncommon in my collegiate circle." Before she was married she was able to do her job from Costa Rica. Behre comes from North Carolina, where Red Hat is based, and tries to go back there four times a year to see family and coworkers. "I didn't have to. The office visits were for soft reasons." She has an agreement that she will be available during business hours, from 7 a.m. to 3 p.m. PST. She could catch up on other work at any time. Her office is a spare room in her family house in Alderbrook, Hillsboro. "I have a printer, but the computer's really all I need these days." She has a laptop and a large monitor with a camera mounted on it, so she's not looking downwards in video conferences. In the neighborhood she is WFH-friends with another tech worker, and someone in finance who works from home a couple of days a week. "I think a lot of companies are going that way." She had time to take a walk with a friend last week, because they were both free. Otherwise she's focused on work. "I don't have virtual chats with people I'm not working with." In the summer, she's walked the mile plus to downtown Hillsboro, but in the winter, she hunkers down and only walks locally for exercise. Alderbrook is a residential-only pocket. High speed internet is essential for Behre's work: For file transfers, for SaaS programs running in the cloud, and for video conferencing. "We use a lot of juice," she says. She had to change carrier, then change back, due to spotty service, and spent $500 on her own router to make sure the connection is solid. "Having 5G would help," she says. The issue that people don't realize is how many houses share the internet node. "In Portland there might be only three people sharing a node, but out here it could be a whole neighborhood. I'd say if you are moving out here, get the best possible router, and find out if 5G is coming, so you can experience the internet as you would at work."